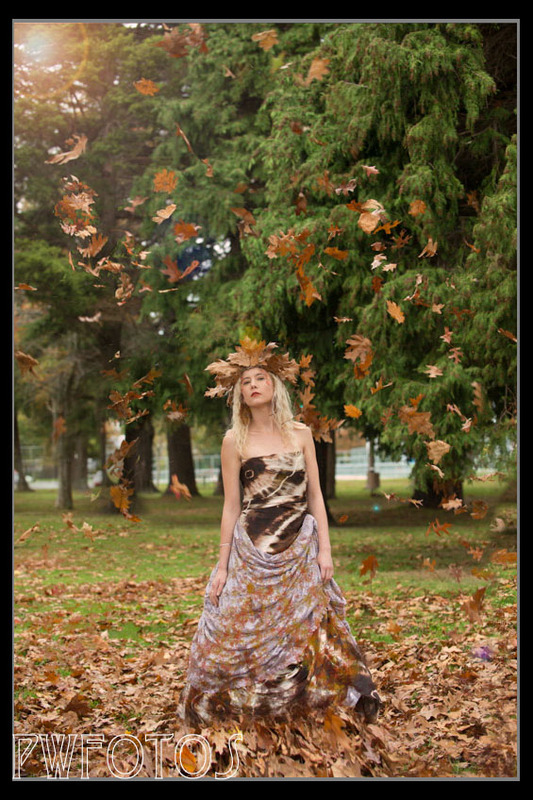 I have for some time wanted to do a a shoot that incorporated autumn colours and fallen leaves. Over Easter Saturday I managed to set up such a shoot with Kat Kellock as the model and Grace Krishnan once again providing hair and makeup. There were several locations that I considered as I wanted somewhere that had an avenue of trees, not too much in the background and with trees that would preferably have leaves of different colours. 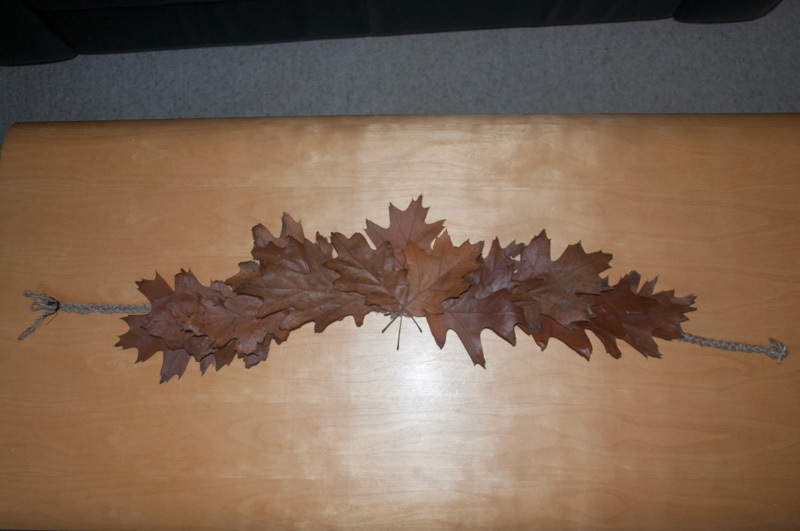 From several possibilities I chose an area in Maidstone Park Upper Hutt which I scoped out on Friday morning, as well collecting a selection of dried leaves from which I intended to make a headdress. As i was able to find the twine I wanted I entered up platting together several lengths of rough string until I got the look that I was after. I knew that we could be running into an issue as the weather in the week before had been dreadful and the forecast for the weekend wasn’t great either. Fortunately the Saturday stayed dry, although the ground and the leaves were wet. This was a shoot where I had decided the whole costume and it is quite amazing what can be achieved with a couple lens of fabric. We had a few issues with makeup but eventually we got to the park. As we were outside I chose to use my 70-200mm mounted on the tripod. This meant that I was able to get images that let let Kat pop out from the background. 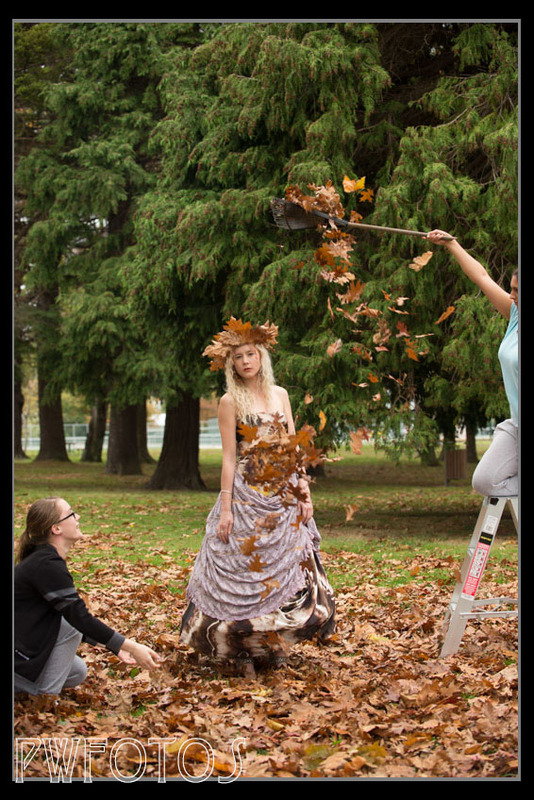 I had wanted to get a shot of leaves raining down which ended up being a lot harder than imagined many due to the fact that the leaves stuck together so rather than falling individually they came down in groups. Grace and my daughter helped with the process as shown in this pullback scene. With a little manipulation in Photoshop we need up with the final image. I then had Kat get on the ground and I shot from higher us. We actually put a tarpaulin on the ground and then covered it with leaves. Everyone seemed to enjoy the day and the shots turned out great.